We receive many requests for photographs of former staff and students of the Slade – from art historians and filmmakers, to members of the public tracing their family history – hoping to locate some images for their project. So it’s particularly exciting when an email or letter arrives from people wanting to contribute their photos and memories to the archive. Slade alumna Susan Glasspool, who studied at the Slade from 1963-66, sent in these images. She recalls receiving a copy of this first photo through the Secretary’s office because it her 3-D lithographs appeared in the background. 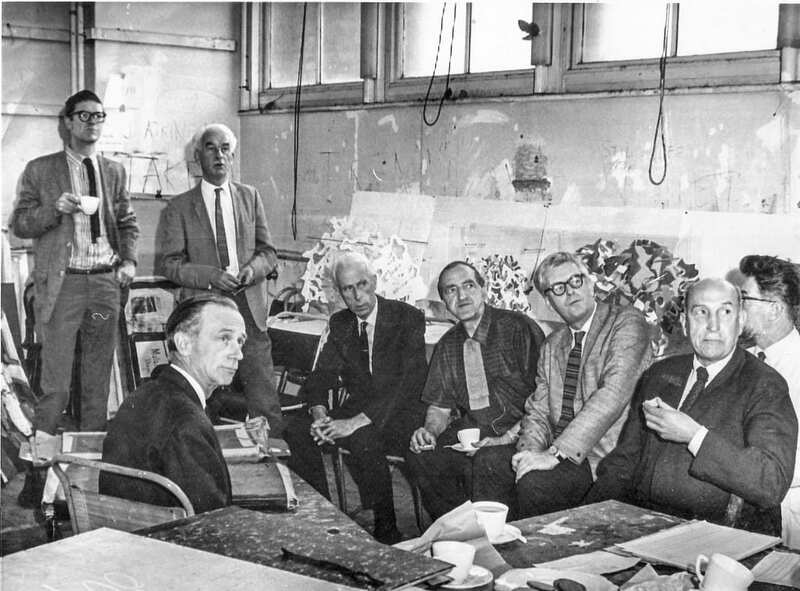 Professor William Coldstream (front left), Andrew Forge (top left) and William Townsend (right of Forge) represent the Slade at this gathering in 1966, which is thought to be the Slade Diploma Examinations Committee. 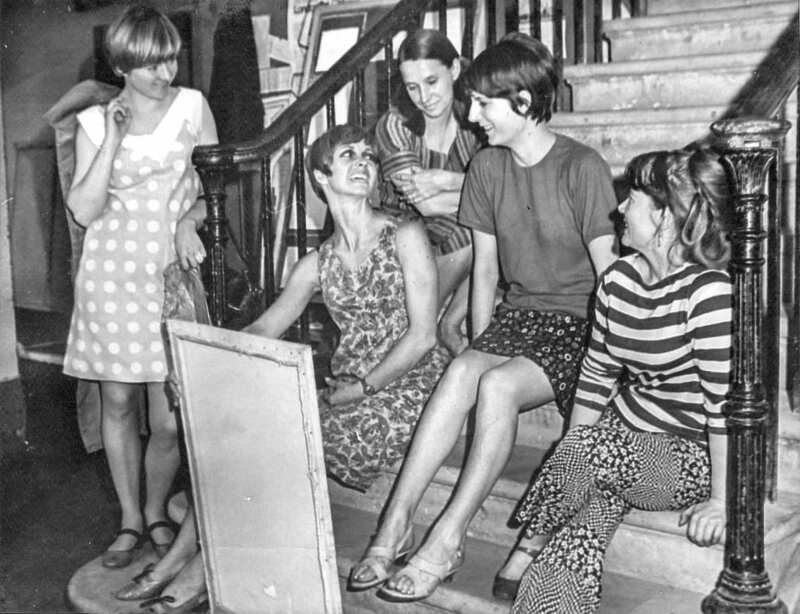 Another photo, taken on the stairs just inside the entrance of the Slade, shows (L-R) Rosemary Johnson, Susan Glasspool, Antonia Frazer and two other unidentified students. Most often, we don’t know much about the who, what, where, when and why behind these images. If you can assist us in contextualizing or identifying people in these photographs, please do get in touch: slade.enquiries@ucl.ac.uk. UPDATED 18 March 2013: Paul Martin has identified the two other sitters on the Slade steps as Diane Shorrock and Jane Ford (far right). What does the Slade Archive look like? Here is a little peek behind the scenes in the archives. 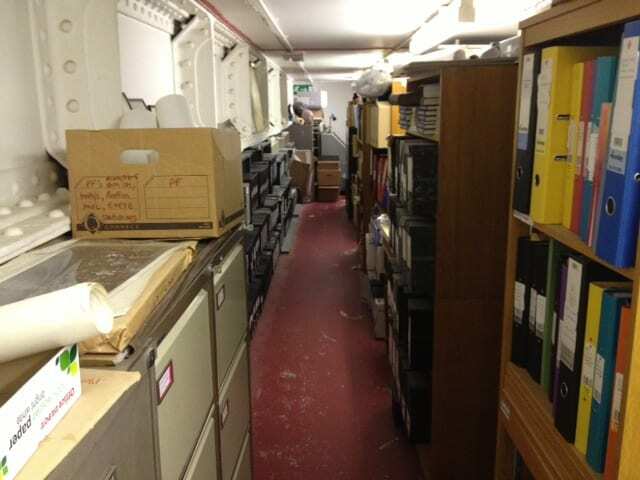 The ‘Slade Archive’ is in fact not a single archive, but is made up of four collections which have been dispersed across UCL; there are materials held in UCL Special Collections and UCL Records Office, UCL Art Museum and within the Slade building itself, so the shelves you see here hold only one part of this rich collection. As of yet, little has been done to digitize and link these collections online. Even more, there are materials here in dire need of repair and conservation before digitization can take place. Through the Slade Archive Project, we hope to develop plans for its future care, but also gather new information, accounts, photographs and other documents from former students, staff and scholars and create online resources for alumni, scholars and family historians which will trace the movement and impact of former Slade students and generate new research about the School and its ongoing legacy.